SANTA CLARA, C.A. 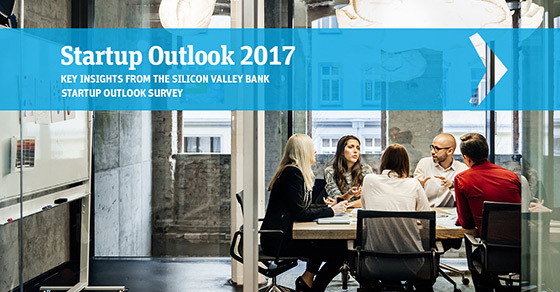 – February 14, 2017 – Silicon Valley Bank (SVB), the bank of the world’s most innovative companies and their investors, released its eighth annual Startup Outlook report today. The U.S. report is based on SVB’s survey of more than 550 executives at technology and healthcare startups in the U.S. and examines their insights on business conditions, fundraising, hiring and public policy issues, including the impact of regulation, taxes and immigration policy. An expanded series of reports offers international perspectives from startup leaders in the U.K. and China. Nearly 950 executives in total completed the annual survey that is intended to take the pulse of startups around the world. For additional survey data, including a closer look at hiring, fundraising and respondents’ views on public policy issues, please visit: www.svb.com/startup-outlook-report/. U.K. and China survey results also can be found here. ©2017 SVB Financial Group. All rights reserved. SVB, SVB FINANCIAL GROUP, SILICON VALLEY BANK, MAKE NEXT HAPPEN NOW and the chevron device are trademarks of SVB Financial Group, used under license. Silicon Valley Bank is a member of the FDIC and the Federal Reserve System. Silicon Valley Bank is the California bank subsidiary of SVB Financial Group (Nasdaq: SIVB).